I remember 28 years ago now driving home from our cottage and the highway was stopped dead. No problem. I had a map showing a side road that went all the way down past the slow area. It went through a few tiny towns and over a river, but it sure looked good as an alternate route. So off my wife and I went. Maybe I should have been concerned that no one else had the same brilliant idea. According to the map we were almost at the river and all we had to do was cross over it and we’d be back in civilization, but it was looking doubtful. And then a hill arose in front of us, and we climbed up it slowly driving on smooth boulders poking through the earth, finally stopping when we came to outright rocks. Climbing up the rocks I had a glorious view of the river below, a paved road on the other side, and absolutely no bridge at all! The map showed a bridge, but there obviously had never been a bridge here. I had to back up for miles before I could turn around! 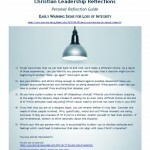 Every person in Christian ministry should read this (secular) book called Integrity: Doing the Right Thing for the Right Reason. I’ll warn you though, it is a frightening read because the author, a clinical psychologist in Toronto, found that the earliest warning signals are things that I think every person already has to a degree in their psychological make-up: the desire to perform well. In fact, society honours and rewards those who exhibit the related behaviours of producing good quality work and having a good work ethic, even as we say we want to avoid their logical extremes, perfectionism and workaholism. The author, Barbara Killinger, says the problem is that these two behaviours are really just socially acceptable diseases. For example, workaholics are overly responsible idealists who have compulsively competitive natures and they seek fulfillment in work. Being responsible is good. Having ideals is good. Being competitive is good (it leads to better value for your ‘clients’). Finding fulfillment in your work is good too. But there can be too much of these good things. You can feel so much responsibility on your shoulders that you feel only you are carrying the weight of the ministry and you become resentful and curmudgeonly, as though the ministry owed you something. You can be so idealistic you will continually be frustrated with the reality of the world around you, so you become angry and bitter. You can become ruthless in your competitive race to win. If you find fulfillment only in your work, you have an unbalanced life and incredible stress as pressures mount in other areas. Workaholism leads sequentially to chronic fatigue and no longer being able to relax or play, guilt over the parts of your life that are falling apart, loss of feeling which means loss of compassion and purpose, and finally character change as you become self-absorbed while leading a dead life of declining physical health. The workaholic is now primed and ready for loss of integrity. Yet employers unconsciously (at least I sure hope it is not conscious) are complicit in their employees’ slides down the slippery slope because they give them laptops and BlackBerrys so they can work 24 hours a day. These are good tools, but need to be used responsibly. Perfectionists have their own issues. They believe they are highly intelligent, superior people. Their feeling of specialness, Killinger says, can foster arrogance or a feeling of entitlement, that they are the exception to the rule and are exempt from community standards. The perfectionist who reaches this point has the attitudes that will support loss of integrity. Perfectionism and workaholism are particularly insidious because they are related to the key threat to integrity: obsession. Killinger says that “If I had to make an educated guess about who might eventually lose his or her integrity, it would likely be an individual who has become obsessively fixated on a thought, idea, or action.” So what are the pre-conditions that lead to obsessive thinking? It turns out that all the pre-conditions are related to the choices we make about how we think about things. If the choice was between stealing or not stealing, that would be an easy decision. Will you cheat on your spouse? “No, of course not!” you say. But that is now. How does someone get to the place where they can say “Yes”? They get to that point when they have no empathy or compassion left for their spouse, when their intuition has become negative so that it is slow to speak up and the person becomes bored, impatient and impulsive. You get to this stage through more innocent choices you make, such as the choice a perfectionist makes as to how to handle self-doubt. The choice a person with chronic fatigue makes about whether to press on with work or give in to sleep. The choice a creative person makes about whether or not to be concerned when it takes 12 hours to do what it usually took 8 hours to do. These are among the many conditions that Killinger says are pre-cursors to loss of integrity. And that is what makes this book so scary. We associate loss of integrity with the obviously bad choices people make, and we say “So I won’t do that!” But the road to lost integrity starts with nothing so obvious. It starts with apparently benign and unrelated symptoms that we choose to ignore because we don’t appreciate their true significance. The choices we should be concerned about are not what we choose to do at the end of the road, but what we choose to think at the beginning of the road. It is at this point that we can most easily avert what Killinger calls “the predictable breakdown syndrome.” But even if you have started to slide, it is still possible to grab on to a branch and keep from sliding all the way down. Here’s an important point about integrity. Integrity means being consistent and predictable, acting in ways that are consistent with what you say you believe. Moral failure such as cheating on your spouse is one form of lost integrity, assuming you say you believe in faithfulness to your spouse. That is an obvious sin. But we must remember that any behaviour that is not consistent with our Christian view of life would also be a loss of integrity. Skipping church. Treating staff as objective resources rather than as humans made in God’s image. Staying silent and insensitive to injustice. You might not fail in obvious sin such as adultery, but you could still lose your integrity as a follower of Christ. This post is closely related to another post, The private life of a Christian leader, in which I wrote about how compartmentalizing life creates a condition in which moral failure is rationalized away. It turns out that Killinger says the same thing. I think the upshot of this is that everyone should have an accountability partner to whom they disclose what they are thinking and feeling. This is a lot more important than disclosing what they are doing, because they won’t be doing anything questionable until long after they have been thinking and feeling that they are alienated, hard-done-by, or any of the other pre-cursor attitudes that Killinger identifies. Accountability relationships should be focused on our attitudes and feelings. I really enjoyed reading it. My church is currently putting on the ‘Valiant Man’ series by Dr. Allan Meyers – have you heard of it? Anyway, I’m not sure if you remember me or not, but I met with you in February – yo u gave me some great job leads. I ended up getting hired at The Gideons International In Canada! Thanks for this. The book is on the reading list.